WhiMSy love: YOWZA! It's the Sunday Featured Artist...Katydid Designs! YOWZA! It's the Sunday Featured Artist...Katydid Designs! Laura is also a teacher of general arts & crafts classes. She has a website, www.katydid-designs.com where she not only sells her artwork, but also business tools to help artists and crafters make a living doing what they love. Her blog, katydiddys, is also a friendly read. Check it out by clicking HERE. Laura's motto? "If it stands still, it can be embellished." And she does mention in her Etsy profile that her husband, baby daughter & dog are constantly active! 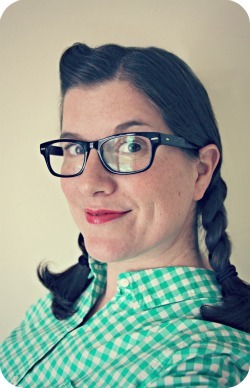 Here's a bit of Q & A with this awesome craftin' gal! Born in Cleveland OH and lived there until I was 12. Then (thankfully!) my parents moved us all to Southern California. I live in "the OC" now. Vintage, retro, sparkles & sweets. I was really crafty as a child, but had a bad art teacher who blew-up all my dreams of a career as a fashion designer. I spent most of my adult life in business-HR & finance, then had a surprise pregnancy and decided to be more authentic about my life & rediscovered crafting & art. I've been doing the crafty thing for about a year now. I'm sorry I spent so much of my life denying myself of my creativity. I believed that *$%#% art teacher! I try to work at least 1-2 hours a day, but I do have a 2 year old, so that's not always possible! I just bought some cool vintage wallpaper for a craft project I'm working on from Unfinished Business & some cupcake earrings from Stuck on You. Those are for a cupcake swap I'm in. I'm hoping to get some of my original watercolor paintings licensed. I'd love to walk into Hallmark & see my work on a greeting card! 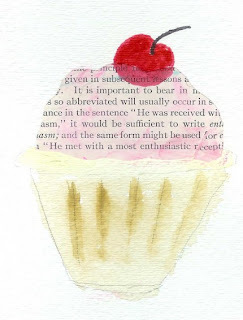 If you could be a cupcake, what flavor would you be? thanks for featuring me! I'm so glad we met! Cupcake sisters forever!